Move faster, deliver more value to clients and grow your agency business with Wyng. – no matter what level of available resources. Reduce out-of-pocket costs and increase promotional budget with a straightforward pricing model. Over-deliver for clients by taking advantage of 24/7 support resources and out-of-the box, custom and full service options. Win more retainer work and new growth opportunities with pitch resources and on-demand mockups of digital experiences. Understand the value and performance of digital experiences with the Digital Campaign Index (DCI), a real-time score that evaluates success. Build valuable audiences for your clients with always-on data capabilities to support retargeting and optimize media investment. Access real-time benchmarks to prove campaign success and sell value to clients. Bring your ideas to life and experiment with new concepts in a free Sandbox environment. Get inspired by other campaigns and our ever-evolving use cases that align with consumer behavior trends. Leverage your in-house tech experts to extend skill sets through open APIs and integrations. Save time and budget by using our full-service development team to build your next digital experience at a pre-scoped, fixed price. Connect all the dots with your CRM, CDP or DMP by integrating data from experiences powered by Wyng. Offload the process of moderating, tagging and securing rights to UGC, so you can focus on the work that matters most to you. Improve team workflow and spend more time on the creative work you love. Bring your creative vision to life with campaigns that match your client’s needs. Build custom campaigns quickly and easily that match the overall campaign vision. Use Wyng to reduce out-of-pocket spend and increase margins. We’re here to support you with resources for your new business activities, information on new use cases, and insights drawn from all our experience working with agencies and brands across industries. Learn to generate buzz, drive traffic, and sell ads in the Media & Entertainment industries. See a comprehensive summary of pre-built use cases in Wyng. 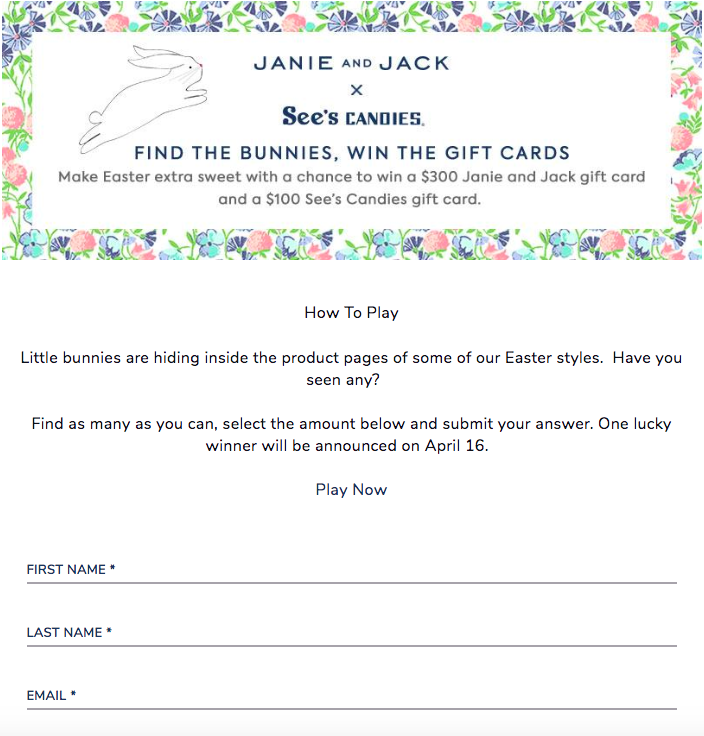 Concept: Host an Easter themed treasure hunt for bunnies across the Janie and Jack website. Have questions about Wyng for Agencies? Reach out to Emily Duke, our dedicated agency account specialist. Emily has been at Wyng for 3 years and managed 200+ agency partnerships. She is passionate about how agencies can monetize their relationship with Wyng and the innovation and differentiation that revenue allows for. Emily runs WoW (Women of Wyng) and loves following advertising trends around female empowerment and body positivity. Her favorite brands include Ben and Jerry’s, VH1, Mattel and Otherwild.